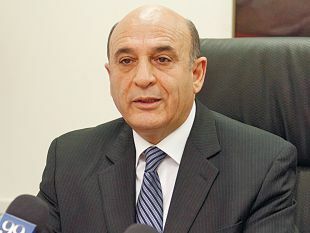 On April 15, Israel Defense Forces Chief of Staff Shaul Mofaz called the defense minister, Benjamin Ben-Eliezer. “The Shin Bet has tracked him down. We know where he’s hiding,” Mofaz told the minister. “I don’t want him liquidated – just arrest him,” Ben-Eliezer implored Mofaz. In his view, the most-wanted individual would be the next leader of the Palestinians, after the Yasser Arafat era. In the months before he was located, Marwan Barghouti behaved like a hunted man. “We tried to eliminate him twice, we wasted his people right and left,” Avi Dichter, the head of the Shin Bet security service at the time, told Haaretz. On March 29, 2002, the IDF launched Operation Defensive Shield, to conquer the Palestinian cities in the West Bank. The month that heralds spring would be remembered in Israel as “Black March”: 110 civilians and soldiers were killed in terrorist attacks, mostly in suicide bombings. Wiretapping revealed that Barghouti was hiding in a safe house. The commander of the army’s Ramallah Brigade at the time, Brig. Gen. (res.) Ilan Paz, told Haaretz: “When the intelligence arrived that he was in a building in the heart of a Ramallah neighborhood, [forces from] an armored brigade surrounded the site and the baton was passed to me. The Duvdevan unit was under my command. We understood that he was in the building. One of the soldiers saw him through the window, taking cover close to what looked to us, at least, like an old woman who was lying on a bed. We removed everyone from the building. I called the division commander, Yitzhak Gershon, and told him that if I were in his place, I would reconsider the whole matter. 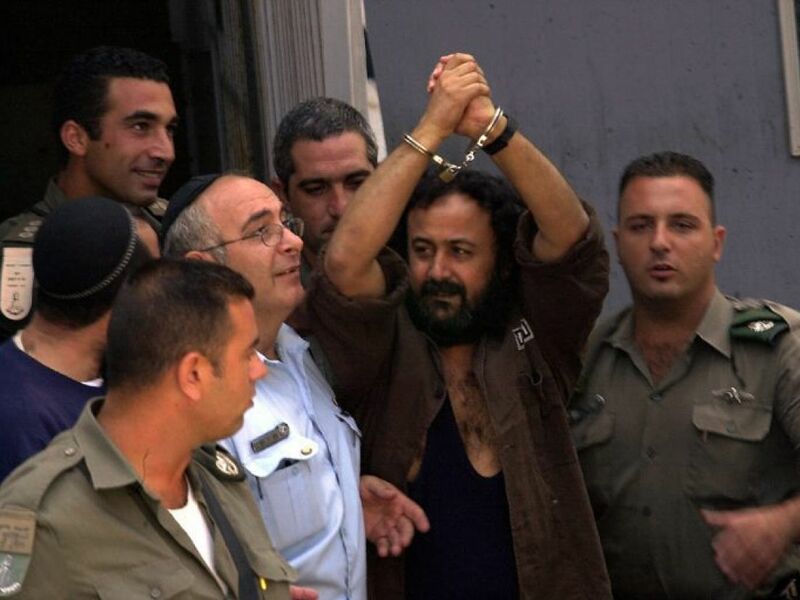 In the meantime, Barghouti has already announced that if Abbas steps down and a presidential election is held, he will run from his cell in Hadarim Prison, near Haifa, where he is serving five life sentences. .
“He [Barghouti] has been well ahead of his rivals in every public opinion poll conducted in recent years,” Dr. Khalil Shkaki, director of the Ramallah-based Palestinian Center for Policy and Survey Research, told Haaretz. 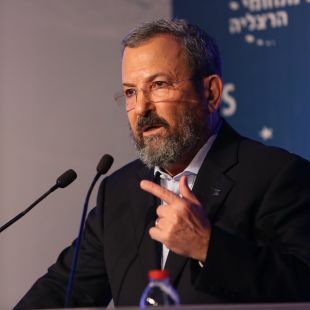 In the center’s most recent poll, conducted this month with the participation of 1,200 interviewees in the West Bank and Gaza, support for Barghouti stood at 40 percent, as compared with 20 percent for Abbas and 35 percent for senior Hamas figure Ismail Haniyeh. In a poll conducted last March, which posited a scenario of an election fought between Barghouti and Haniyeh, the former received 57 percent, the latter 39 percent. The poll found that in a contest between Haniyeh and Abbas, the Gaza-based leader would win handily, by 52 percent to 41 percent. According to Shkaki, it’s important to bear in mind that the majority of the Palestinian public doesn’t believe that an election will be held anytime soon. Nevertheless, he says, in a scenario in which Abbas’ term suddenly ends, Fatah and PLO institutions will have to take immediate steps to bring about the election of a successor. “There is no doubt that Marwan Barghouti is in a better opening position than any other candidate,” Shkaki concludes. Even if he wakes up to a prison rollcall every morning for the rest of his life, Barghouti today appears to present a complete conceptual alternative to Abbas when it comes to key issues: reconciliation with Hamas, the immediate cessation of security cooperation with Israel, Palestinian Authority support for nonviolent mass protest against Israel and a boycott of Israeli goods. Barghouti thinks that the “intifada of knives” is a fatal mistake. In a conversation via a mediator who visited him in prison in late June, he told Haaretz that a popular protest should encompass hundreds of thousands of people from all the Palestinian groups, including Hamas and Islamic Jihad. The protest has to be persistent and systematic, in order to create international pressure on Israel to return to the negotiating table and end the occupation. Barghouti is regularly visited by Arab Knesset members, some of whom see him as a future leader. “He has an 86-percent support rating among the Palestinians,” says MK Ayman Odeh, head of the Joint List of Arab parties. Odeh recently brought Barghouti the massive 1999 biography of Nelson Mandela by the British journalist and writer Anthony Sampson. MK Jamal Zahalka, chairman of the Balad party, a faction within of the Joint List, visited Barghouti a week ago and relates that the latter viewed the collective run of the Arabs in the last Knesset election as a model for emulation, “for his aspiration to unite Fatah and Hamas in a nonviolent protest revolution. He is the best candidate for president. He has an enlightened worldview about women’s rights, for example,” Zahalka notes. Barghouti’s close friend and lawyer, Elias Sabbagh, visits him weekly. Last week they met at Gilboa Prison, to which Barghouti was abruptly moved when the Hadarim Prison authorities received “intelligence information about a planned disciplinary infraction,” according to an Israel Prison Service source. But Barghouti is pessimistic about that happening in the foreseeable future. “No de Gaulle or de Klerk has yet arisen in Israel,” he noted from his cell. “The idea is to mobilize hundreds of thousands of people, who will march to Jerusalem,” former PA Minister Qadura Fares tells us as he stubs out another Rothmans cigarette. Fares is considered a close associate of Barghouti, his representative on the outside. He too is very familiar with Israeli prisons, having spent 15 years in them for his membership in a Fatah armed squad. He was released in the wake of the Oslo accords. Recently, the journalist Avi Issacharoff revealed the existence of understandings that were reached earlier this year between Fares and senior Fatah officials close to Barghouti, and Hamas, concerning the renewal of the Palestinian struggle in the spirit of Martin Luther King, Jr. and Mahatma Gandhi. You have consistently failed to conduct a nonviolent struggle, and instead were tempted into suicide attacks. A photograph in Fares’ office shows Barghouti, in a prison uniform, powerfully gripping the hands of a young prisoner named Thaer Hamed, the two of them flashing victory smiles. Here they are, the two symbols of the second intifada. How do you resolve the contradiction between admiring the sniper and urging nonviolent protest? Are we to conclude that you believe the second intifada was a mistake? 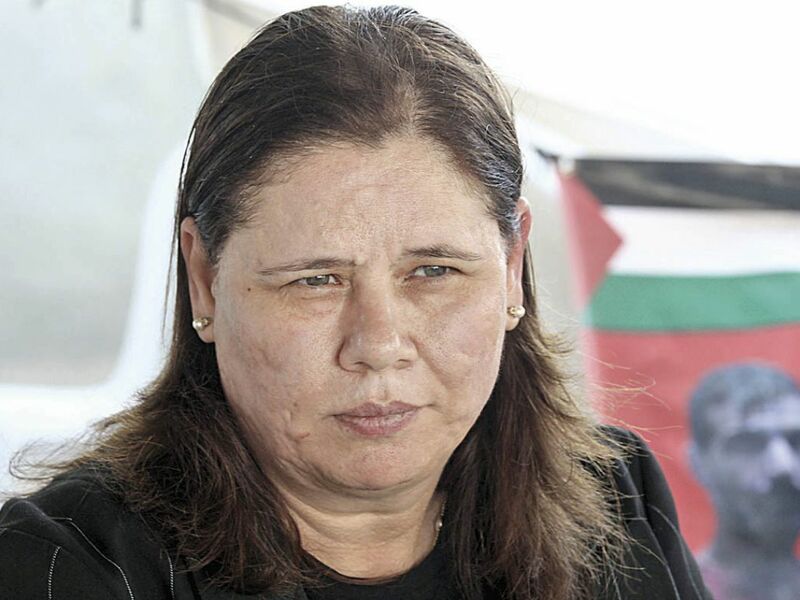 Attorney Fadwa Barghouti, the prisoner’s wife, has an office on the sixth floor of a gleaming office building in the center of Ramallah. On the walls are photographs of and paintings by her jailed husband. 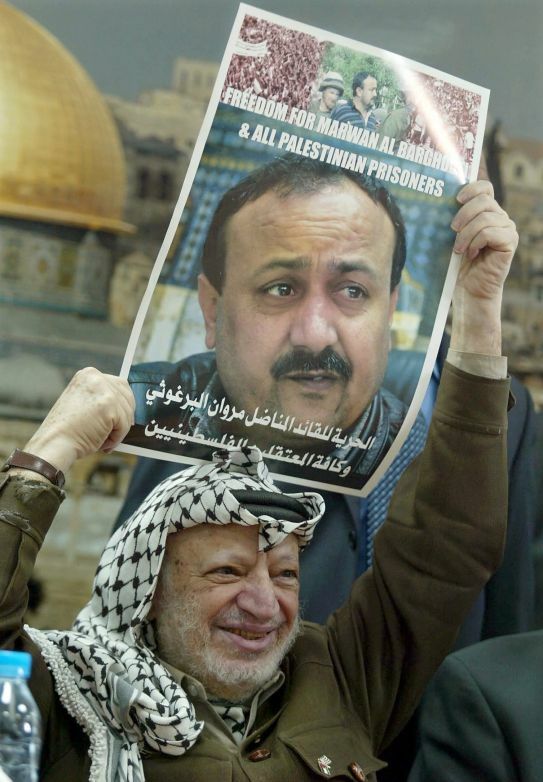 Since Barghouti’s incarceration, Fadwa has managed a PA-financed fund whose purpose is to create international pressure to bring about his release and in general to cultivate his myth, which has much in common with the aura that developed around Mandela in South Africa. She travels widely, meeting with foreign ministers and shapers of public opinion. The campaign for Barghouti’s release was launched in 2013 from Nelson Mandela’s cell on Robben Island, in South Africa, where many leaders of the anti-apartheid struggle were imprisoned. Squeezed with Fadwa Barghouti in the tiny cell on the occasion was Ahmed Kathrada, another fighter against the racist regime, who also served an extended sentence in the prison. Signing the Robben Island declaration calling for Barghouti’s release were eight Nobel Peace Prize laureates, including former U.S. President Jimmy Carter and Desmond Tutu, himself a veteran of the South African campaign. This year, Tutu sent a letter to the Nobel committee, urging it to bestow the Peace Prize on Barghouti. Adolfo Perez Esquivel, the Argentine human-rights activist who himself won that prize in 1980, together with several Belgian members of parliament, has also proposed that the prize be given to the man now serving five life sentences in Israel, after being convicted of murder – noting his commitment to democracy, human rights and equality between men and women. In his first years of imprisonment her husband was in solitary confinement and she was not allowed to see him, with the exception of one dramatic visit that was authorized by the bureau of Prime Minister Sharon. In recent years, she has been allowed two 45-minute visits a month. Phone calls are prohibited. She brings him books he requests (she’s allowed to bring one book a month). In addition to obsessive reading of books (eight to 10 a month, according to his confidants, including, recently, David Landau’s biography of Sharon), he has a subscription to Haaretz English Edition, watches the daily current-events program “London and Kirschenbaum” and Israeli newscasts religiously, exercises in the small courtyard and gives talks to prisoners. 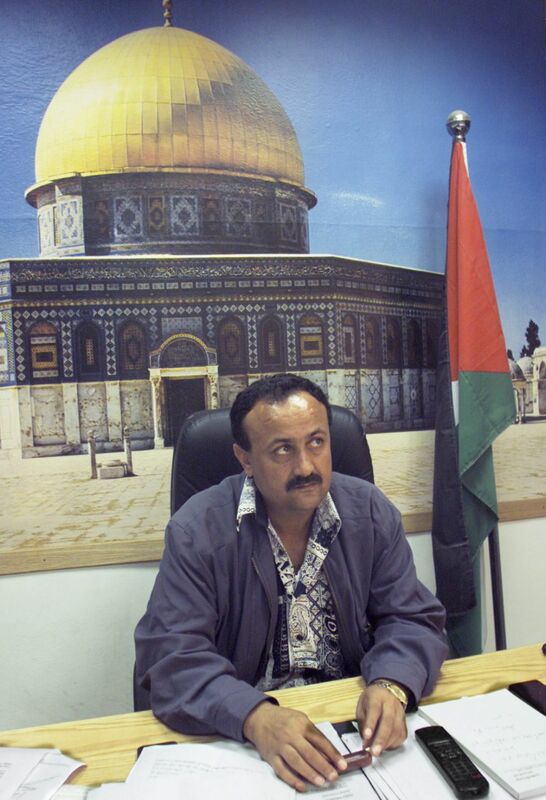 Marwan Barghouti was born in Kobar, a small village near Ramallah, in 1959. He was arrested for the first time at age 15, for taking part in demonstrations against the occupation. In 1978, at age 19, he was tried and sentenced to five years in an Israeli prison for being a member of Fatah squads. During his prison term he completed his high-school studies. After his release he married Fadwa, a distant relative; their wedding was postponed time and again because of Barghouti’s frequent interrogations and arrests. “He wasn’t by my side in any of the births of my four children,” Fadwa Barghouti relates. The couple’s firstborn was named Qassam, after Iz al-Din al-Qassam, a pioneer of the Palestinian national struggle. In May 1987, Barghouti was expelled to Jordan. His deportation, along with some of the university’s leaders, was meant to be an Israeli “preemptive strike,” to contain ferment. However, seven months after the wave of arrests, the first intifada erupted, stunning the Shin Bet and the Israeli intelligence community – and Yasser Arafat and the PLO leadership in Tunis, as well. Fadwa Barghouti joined her husband, and their family moved back and forth between Jordan and Tunisia. According to a former senior Shin Bet official, during the intifada, there was at least one case of the murder of a settler that showed involvement by Barghouti, who was in Jordan at the time. In 1994, following the signing of the Oslo Accords and the advent of PLO leadership in the Gaza Strip, Israel allowed Barghouti to return. “In contrast to others, he really and truly believed that Oslo would be a five-year period after which the Palestinian state would be established,” Fadwa Barghouti recalls. “But the assassination of [Prime Minister Yitzhak] Rabin caused tremendous damage to the process. After the rise to power of [Benjamin] Netanyahu, he understood that the process would not be realized. Contrary to your description, Barak’s offer at Camp David was not generous. The growth in settlement construction and the building of the bypass roads showed us that you had no interest in reaching an agreement. In the period between Oslo and the second intifada, Barghouti forged an extensive network of social ties with Israeli politicians. One of Barghouti’s close friends at the time was Haim Ramon, a former cabinet minister. 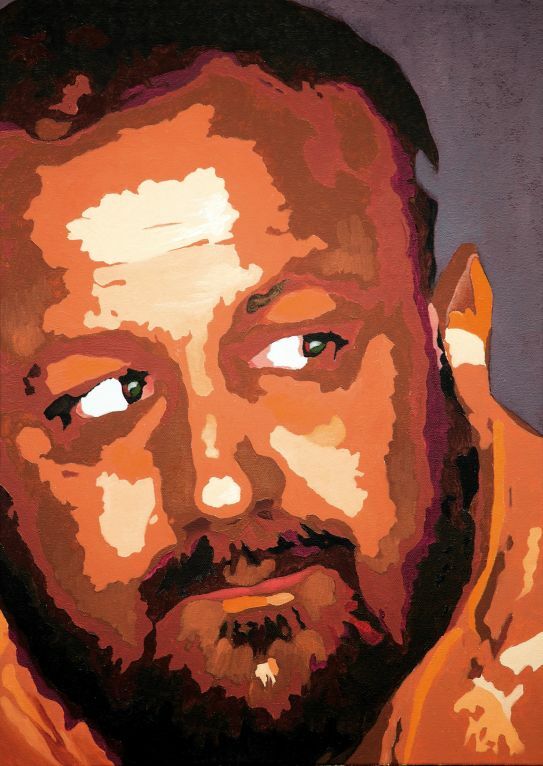 During Barghouti’s years of flirtation with the Zionist left, he occasionally made statements that fractured his image as an optimal partner, and perhaps augured the future. Examples are his suggestion to the Palestinian parliament to send condolences to the family of a terrorist who blew himself up in Café Apropos in Tel Aviv in 1997, and a reference to the Gaza-based bomb-maker, Yahya Ayyash, known as “the Engineer,” as a shahid, or martyr for the cause. “It is an internal Palestinian discourse,” Barghouti explained to Israelis who felt he was deceiving them. In those years he established the Tanzim, a political organization that reflected the status of the local population as against the suited, cigar-smoking figures who arrived from Tunis. Barghouti opposed the security mechanisms created by Arafat, and accused their chiefs publicly of thuggery and corruption. 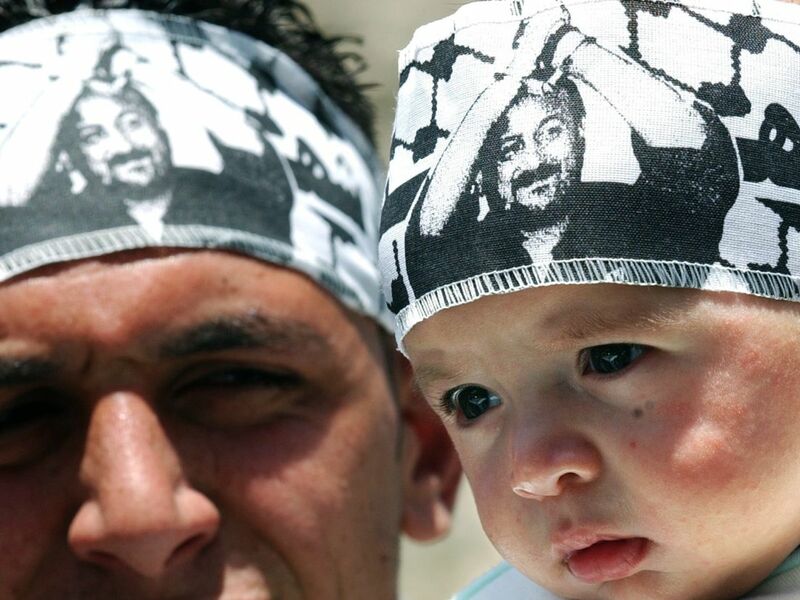 In 2000, on the eve of the Camp David conference, Barghouti declared that, “Arafat does not have the right to forgo the refugees’ right of return.” The conference ended in failure, with Ehud Barak declaring that there was “no partner” for peace. Two months later, on September 28, 2000, MK Ariel Sharon, the leader of the opposition, visited the Temple Mount. Riots broke out across the territories. The IDF, which in the months preceding Camp David had trained for a Palestinian-initiated war, reacted aggressively. “Initially, the proportion of those killed was 15:1 against the Palestinians,” former Shin Bet director Diskin noted in an interview with the Channel 10 program “The Source,” which dealt with the lessons of the second intifada. 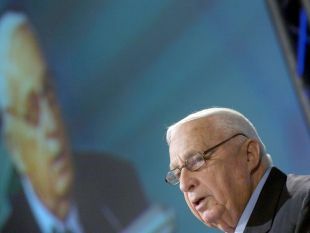 Diskin disagreed with the claim by the heads of the IDF that the Palestinians had planned a war. 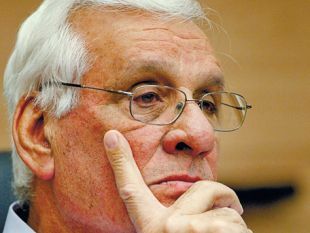 Three days before Sharon’s visit to the Temple Mount, and the subsequent outbreak of disturbances in the territories, Carmi Gillon, a former Shin Bet director who was then head of the Peres Center for Peace, met with Barghouti in the lobby of the Hyatt Hotel in Jerusalem, in order to plan joint projects for Israeli and Palestinian youth. He was then considered the leader of the militant stream. Some senior IDF personnel claimed at the time that he overshadowed Arafat in his power and influence, and that the Tanzim he led were armed, contrary to the Oslo Accords. “Maybe you can send him to Alaska for a few weeks for a cooling-off period?” Foreign Minister Shimon Peres suggested to Arafat in a meeting. Subsequently, the Shin Bet received intelligence to the effect that Barghouti, through people loyal to him in the Tanzim and the Al-Aqsa Martyrs Brigades, provided funding and arms that were used in a series of terrorist attacks in the territories against soldiers and settlers. A Greek monk was killed because assassins mistook him for someone else. Probably the most highly charged moment of the second intifada came in January 2002. The American envoy Gen. Anthony Zinni had arrived in Israel a few weeks earlier and negotiated a cease-fire, which collapsed when the IDF assassinated Raad al-Karmi, from the Tanzim, by means of a bomb. Karmi, who had carried out dozens of terrorist attacks against Israelis, was on his way to his lover at the time. The assassination, which provoked a fierce debate within the Israeli defense establishment, led to Black March and Operation Defensive Shield in April. Barghouti, who had been Karmi’s patron, called for revenge. Some Tanzim attacks were perpetrated within the Green Line, including the shooting of three people at Tel Aviv’s Sea Food Market restaurant. Barghouti would later claim that he had given instructions that the attacks be carried out only in the West Bank. This was the juncture at which the decision was made to intensify the effort either to arrest or assassinate the No. 1 wanted Palestinian. After his arrest, Barghouti underwent intensive interrogation by Shin Bet agents “Mofaz” and “Smith.” The memoranda that the interrogators wrote to sum up the conversation with Barghouti constitute his narrative about the origins of the second intifada. Barghouti admitted to the interrogators that his involvement in the violence was partly due to the power struggle in the Palestinian street, “in order to force out Hamas and Islamic Jihad,” and inter-generational struggles for control among the Fatah leadership. He told the interrogators that he assumed full responsibility for the Fatah attacks, but not for those inside Israel, to which he was adamantly opposed. Four months after his arrest, the state accused Barghouti of involvement in 37 terrorist attacks and acts of terror. The justice minister at the time, Meir Sheetrit, suggested that his trial, in a civilian court, be televised, “like the Eichmann trial” (which was broadcast live on the radio). Barghouti declined to defend himself or summon witnesses, claiming vehemently that he did not recognize Israel’s right to try him. He was convicted on five counts of murder and sentenced to five cumulative life terms in prison plus 40 years for attempted murder and membership in a terrorist organization. Following Yasser Arafat’s death, in November 2004, Mahmoud Abbas, who opposed the path of armed struggle followed by Arafat and Barghouti, was appointed his temporary successor. From his isolation cell, Barghouti declared that he himself intended to run for president. Information reached the Israeli leadership that the two people closest to Barghouti – his wife Fadwa and Qadura Fares – were opposed to the idea, and they convinced him to withdraw. Unusually, the Prime Minister’s Office allowed the two to visit Barghouti, who had been in total isolation in the Be’er Sheva Prison for two years. “I went to see him at Abu Mazen’s request. Today I admit that I made a mistake when I pressured him not to run,” Fares admits, and recalls the dialogue between them. Fares: Marwan, let’s say that on January 10, 2005, we get up in the morning and you are the president of Palestine. What will you do for us? You are in solitary here in Be’er Sheva. Barghouti: And what will Abu Mazen do? Fares: I am under no illusions that Abu Mazen will succeed in establishing Palestine. But he can rehabilitate the home after the destruction of the intifada, rebuild the institutions, promote democracy and continue the political process. Barghouti: Remember, Qadura, the Israelis will not give us anything. They will not allow you to achieve anything. Barghouti: When a leader has only one option, there is no reason for the Israelis to give him anything. 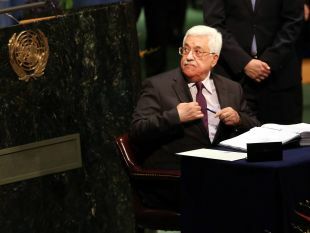 And Abu Mazen will go only for the diplomatic option, for negotiations. We’ve tried a struggle without negotiations, and negotiations without a struggle, and it didn’t help. Only negotiations and a struggle will assure the liberation. In 2004, Barghouti supported the Israeli government’s plan to withdraw from the Gaza Strip. He later sent a letter from prison asking the Palestinians not to react with violence when Israel evacuated the Gaza settlers. On the eve of the dramatic move by Sharon, an imagination-firing Israeli initiative was put forward by the ambassador to Washington, Danny Ayalon. That formative text calls for the establishment of two states alongside one another, based on pre-1967 boundaries, implementation of the right of return and adoption of previous agreements between the sides, abandonment of the armed struggle within Israel proper, and the introduction of democracy as well as equal rights for women. However, on June 25, 2006, the day on which Hamas Prime Minister Haniyeh was supposed to announce the document’s acceptance in the name of the organization, members of Hamas’ military wing kidnapped Corp. Gilad Shalit along the Gaza border. The signing ceremony was suspended. It would be another five years before Netanyahu, who became prime minister for the first time in 2009, would sign an exchange-of-prisoners deal for Shalit – without Barghouti’s inclusion. Earlier, the Olmert government had also left him incarcerated. 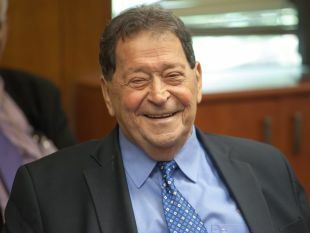 Haim Oron, the former Meretz leader, relates that Defense Minister Ehud Barak told him that he considered Barghouti’s arrest to have been a fundamental mistake. Nonetheless, the Olmert-Barak government did not free him, either. Barghouti supported the negotiations conducted by Olmert. He told confidants at the time that if it depended on him, he could sign off on a final-status agreement “within a few days.” Some in the Israeli establishment believed that Barghouti’s support for negotiations was authentic. As proof, they noted that Barghouti’s closest confidants, led by Fares, had signed the Geneva Initiative, an unofficial framework for an agreement worked out by teams of Israelis and Palestinians, a few years before. 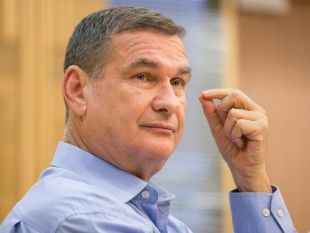 “I would not have signed it if I were against it,” Fares told Haaretz. Other Israeli governmental sources, however, maintain that Abbas has always behaved duplicitously. “We know that he occasionally asked the Americans for his [Barghouti’s] release, including in a tete-a-tete with President Obama,” says a knowledgeable source. “But there were also assessments that, for fear of his own survival, Abu Mazen preferred that Barghouti remain in prison.” According to MK Zahalka, “There were years when they didn’t want to hear his name in the Muqata” – the Palestinians’ headquarters in Ramallah. “Over the years, Abu Mazen did not make the required effort for my release,” Barghouti himself told Haaretz. In recent months, Jerusalem Affairs Minister Zeev Elkin has met with academics to discuss the situation that will ensue after Abbas’ departure. Most of his interlocutors told him that Barghouti is the only Fatah figure who could defeat Hamas in an election. This has not led Elkin to join the chorus of those urging his release. “On the day after Abu Mazen, the PA will collapse, and we need to be ready for that,” Elkin tells Haaretz apocalyptically. “In my estimation, Fatah will not risk an election, which it might lose to Hamas, and even if it takes the chance, the Netanyahu government will not allow the Arabs of East Jerusalem to vote.” Elkin sees a likely situation of chaos and violence in the immediate post-Abbas period, and also believes that Barghouti will rot in prison. In the view of some, Abbas’ three posts (PLO chairman, Fatah chairman, PA president) will be divided among three different individuals. The PLO chairman will be the senior figure and will spearhead political moves, the PA president will be a technocrat who will handle administrative affairs, and the Fatah leadership will be taken by a third person from the organization. And what will happen if there is an election and Barghouti wins it? “The [Israeli] security cabinet has not yet held a discussion relating to that question,” a cabinet minister tells Haaretz. President Reuven Rivlin, who is today against Barghouti’s release, has held a few meetings with political figures in which the question arose of what Israel should do if Barghouti is elected president. Rivlin said in those conversations that the country’s leaders should, in that event, recalculate their course and do what meets Israel’s interests best. In Rivlin’s opinion, if the international community sees him as a Mandela-like figure and exerts pressure for his release, it will be against Israel’s best interests to have him remain in jail.